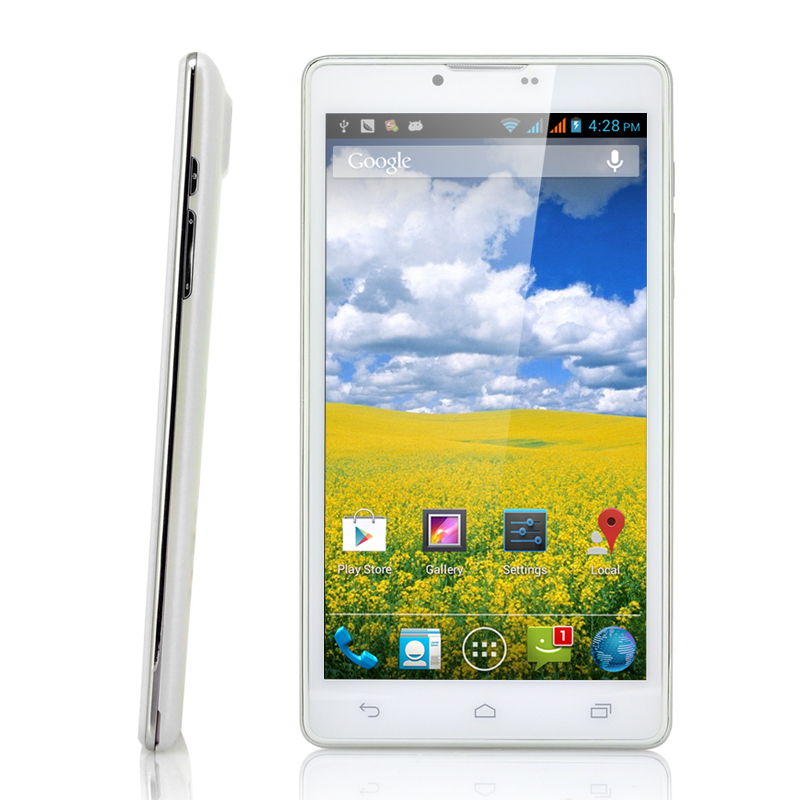 Successfully Added 6 Inch Android 4.1 Dual Core Phone "Ivoire" - 1GHz, 3G, Dual SIM to your Shopping Cart. 3G Android 4.1 phone with fast 1GHz Dual Core CPU, 512MB of RAM, and a large high end 6 Inch touch screen is a great combination of both a phone and a tablet giving you a 2 in 1 phablet. Supporting Dual SIM cards, the “Ivoire” will make it easy for you to keep work and private life separated by easily switching between two numbers on one phone. Also supporting both GSM and WCDMA networks, you’ll be able to use this phone almost anywhere in the world. Other great features of this phone include a GPS for accurate navigation, Bluetooth for easy wireless file transfer and a great 8MP camera. Running on Android 4.1 Jelly Bean, the “Ivoire” offers extended customization possibilities and an impressive Google Play store filled with over 700,000 apps. The great design of the “Ivoire” combines the capabilities of a phone with the size of a tablet, otherwise known as a phablet. Phablet is an informal class of smartphones with screen sizes ranging between 5 and 7 inches; these are mainly designed to combine the functionality of a smartphone with that of a tablet. While a phablet is larger in size than most smartphones, they are smaller in size and slimmer than most miniature and full-sized tablets, making them more convenient for users to carry them. This elegant but modern android 4.1 cell phone is now available and in stock in our warehouse. Ready for next day shipping and backed with a 12 months warranty, the “Ivoire” is brought to you by the leader in wholesale Android phones, Chinavasion.